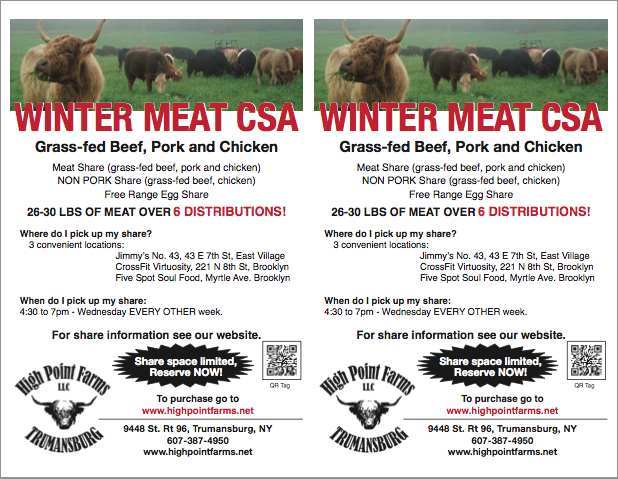 Sign-up for High Point Farms Winter CSA! High Point Farms still has space for more members! Sign up today for their Winter CSA, beginning December 14 and running until February 22. This is a fantastic opportunity to plan ahead for delicious dishes for the holidays, Valentine’s Day (nothing says lovin’ like red meat), and the Superbowl (mini-meatballs? nachos? chili?). Plus, you get that warm, wonderful feeling knowing that you are supporting sustainable local farming and Earth-friendly agricultural practices! There are also absolutely amazing eggs and cheese too! Sign up and come meet your meat! Also, download our flier and help us spread the word about the farm! Click, print, and get the word out!